06/10/2017 16:48:54 - "How to protect yourself from Ransomware! ..." The C.R.A.M. workshop SMAU Milano 2017 on Thursday 26th October. The C.R.A.M. (TG Soft's Anti-Malware Research Centre), given the great interest shown in all the workshops to which it was invited to the various stages of SMAU, will take part in #Smau Milan in 2017 with a very current educational / informative workshop Thursday, October 26 at 10:30 Pad. 4 - Arena SMAU ICT1. To take part to workshop named: "How to protect yourself from Ransomware", you have to join the page WorkShop Smau Milan 2017 where you can also consult the program details. The conference technical and popular nature and aims to present to the public the state of the Crypto-Malware, ransomware encrypting the SERVER PC and data files to request a ransom generally in BitCoin. It will be made an overview of the main groups / types of Crypto-Malware that between 2016 and the first half-year of 2017 have spread most in Italy, included the most known WannaCry and Petya/NotPetya......by analyzing the method of dissemination and the damage they have caused. Completed the overview of the main infection methods used, with real examples and, for each of these methods we will be presented behaviors suitable to avoid infection and / or to combat it effectively. the PC / SERVER was present a heuristic behavioral protection system that is able, then, to report and mitigate the effects of the attack also by new generation variants not yet identifiable by the method of identification signatures. We have pleasure to give, for everyone who come to our stand (Pad. 4 - A24) our report over Ransomware actually circulating in Italy, as per our compliments => "Ransomware 2017 Italy" has been drafted by Gianfranco Tonello, co-author of Vir.IT eXplorer, founding member and CEO of TG Soft, besides rapporteur at Workshop. Other less known to the laymani. Statistics dissemination of Crypto-Malware in Italy. Why my antivirus is not able to advance intercept these attacks? Why the traditional BackUp systems on many cases are not enough? Simulation of new generation Crypto Malware attack on PC / SERVER where there is a heuristic behavioral protection system. What to do in case of data they were encrypted and does not possess backups for recovery. NOT pay or pay ... that is the question! IT Security Researcher & Software Developer Manager, co-author of Vir.IT eXplorer PRO, CEO of TG Soft and curator of C.R.A.M. Assisted by Federico Girotto responsible for technical support of TG Soft. Technicians of computer companies and systems analysts. End users and SMEs in particular. How to take part to the Workshop "How to protect yourself from Ransomware"
Because to participate in the workshop you need access to SMAU Milano 2017, if you have not yet pass for entry, you can proceed directly from the site of SMAU Milano 2017 ==> PARTECIPA COME VISITATORE with entrance offered by TG Soft. accredit to SMAU Milano 2017, the entrance has a cost of € 15.00, but you can get it FOR FREE from TG Soft accessing the page SMAU MIlano 2017 ==> PARTECIPA COME VISITATORE. join the Workshop "How to protect yourself from Ransomware!" 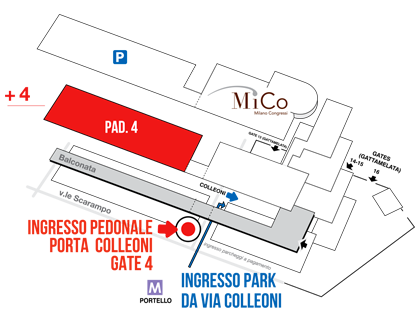 of Thursday, October 26 at 10:30 a.m. at fieramilanocity, Pad. 4 - Arena Smau ICT 1. Dalla Falsa Fattura al Falso Contratto, CryptoLocker / Crypt0l0cker si rinnova. Trojan Renamer: nuova tipologia di ransomware che va a cifrare i nomi dei file in un Crypte@INDIA.COM e ti chiede un riscatto. Cryptomalware in arrivo con una falsa fattura TIM. Ransomware Cerber 3 inaugura il 2017. Nuova versione di Petya Goldeneye 4.0: chiede un doppio riscatto per Mischa e Petya! 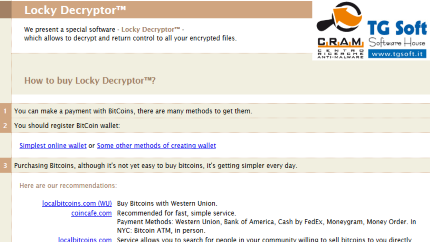 CryptoLocker ritorna a fine novembre, le mail SDA EXPRESS nascondono il pericoloso ransomware. Nuova variante di PClock Ransomware. Persistente diffusione di false email di Equitalia, diffondono nuove varianti di CTB-Locker. Falsa email di ENEL diffonde nuove varianti di CryptoLocker! Nuovo Crypto-Malware in circolazione: attenti a UltraCrypt! 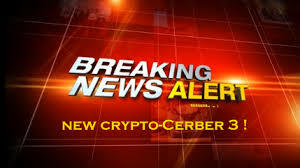 Nuovo cryptomalware che si spaccia per FBI cifra i file di dati e richiede riscatto in BitCoin!!! Il punto debole di Petya Ransomware! CryptoLocker ritorna a colpire diffondendosi tramite una falsa email di SDA! Nuovo cryptomalware in circolazione: attenzione a HydraCrypt! Petya Ransomware ai raggi X !!! Cerber il ransomware che ti parla con il motto "Ciò che non mi uccide, mi rende più forte"
assist, upon registration, to the events including conferences, training workshops and business workshops scheduled. Anti-Malware Research Centre, TG Soft S.a.s. Any information published on our website can be used and posted on other websites, blogs, forums, facebook and/or in any other form both on paper and electronically so long as you always cited source explicitly "Fonte: C.R.A.M. by TG Soft www.tgsoft.it"